How to bake butternut squash. Part of ‘Little Things Fall & Halloween’. Shopping list: butternutt squash, oil, spinach or basil, onion, red and green peppers, double cream, grated parmesan, gorgonzola and mozarella cheese. Cut squash in half, scoop out the seeds,brush with 1tbsp oil and roast for 1 hr (at 200 C ). Mix together some spinach or basil, sliced peppers, onion and 3tbps of double cream. Put mix into squash cavities. You can add some gorgonzola and mozarella cheese. Sprinkle parmesan on top. Bake for further 20 minutes (at 170 C/190 C or fan/gas 5) or till cheese bubbles. Baked butternut squash. Delicious fall recipe. Low FODmap butternut squash fries. Mhhh, looks delicious. I will try this. Let me see, maybe tomorrow 🙂 It`s fast and easy to make. Have a nice weekend my dear! Hope you and your family will like it! 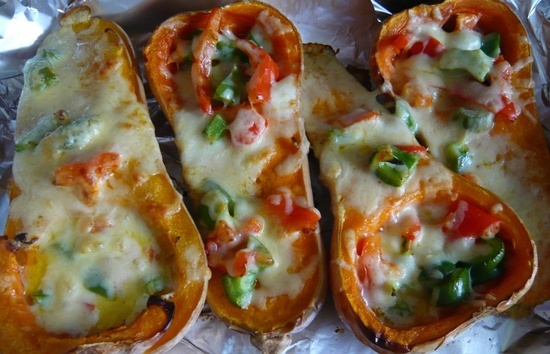 Mmmm, I’m on a huge squash kick and this looks like what I’m making for dinner tonight! I never cook with squash, but you cover anything in cheese and I will probably eat it. Looks Delish! Hi Mila! The squash looks delicious! I’ve never tried it this way but I will now! Thanks for sharing! Happy Fall! Blessings from Bama! Hi Mila! Thank you for linking up at Tasty Tuesdays! Your post has been pinned to my Recipes from Tasty Tuesday board. I can’t wait to see what you link up next week! Looks delicious and easy! I’m putting butternut squash on my shopping list this week.